For recent grads, building and maintaining a standout LinkedIn profile isn’t optional or even highly recommended — it’s essential. That’s because LinkedIn is for more than networking your way into a company or keeping in touch with former classmates. A full 95% of recruiters use LinkedIn to actively search for and contact potential employees, according to a 2014 survey by recruiting platform Jobvite. 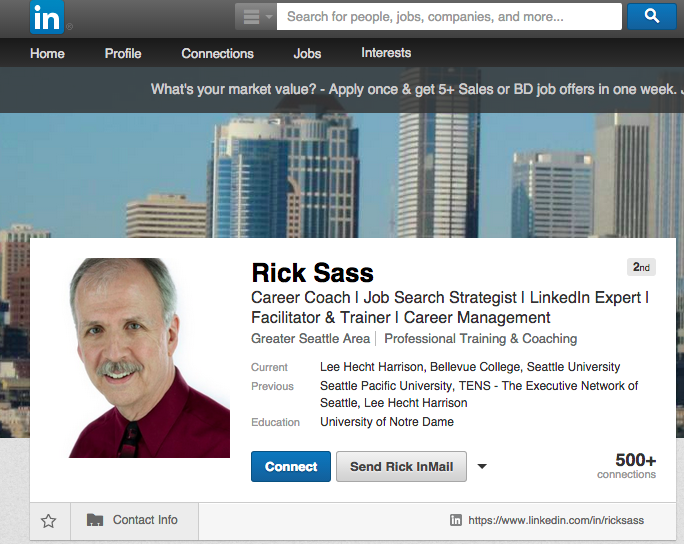 “If you don’t have a presence on LinkedIn, you stand a strong chance of being overlooked,” says Rick Sass, a career coach and LinkedIn expert at Lee Hecht Harrison in Bellevue, Washington. 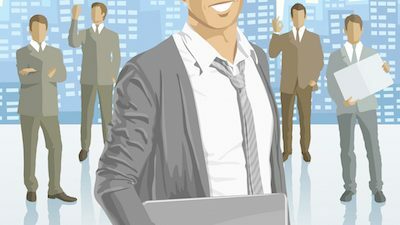 Customize your LinkedIn profile using these five strategies and employers will be more likely to find and hire you. It’ll make your life as an applicant a whole lot easier. “Define yourself using nouns that describe what it is you do and what it is you want to do,” Sass says. Try not to default to your job title even if you’ve landed a fabulous first job. “Marketing analyst” might be the name of your position, but “Quick-thinking marketing pro with an eye for catchy, viral content” will tell a recruiter that he or she should learn more about you. “The first thing people are going to look at is the visual,” Sass says. Your background image is an opportunity to share your interests: Choose a landscape photo of your favorite place to ski or hike if you’re outdoorsy, or a baseball diamond if you like sports. Avoid potential copyright issues by taking the photo yourself or choosing from Flickr’s Creative Commons database — ideally only a photo with a “commercial use allowed” license, to be cautious. Your profile photo is even more important. Recruiters are 70% more likely to scroll down and read through your professional experience if you have a headshot on LinkedIn, Sass says. It should feature your head and shoulders against a white background. Make sure to smile; recruiters subliminally think to themselves, “‘I want happy, smiley, approachable people on my team,’” Sass says. Take a look at the top of Sass’ own profile as a model. 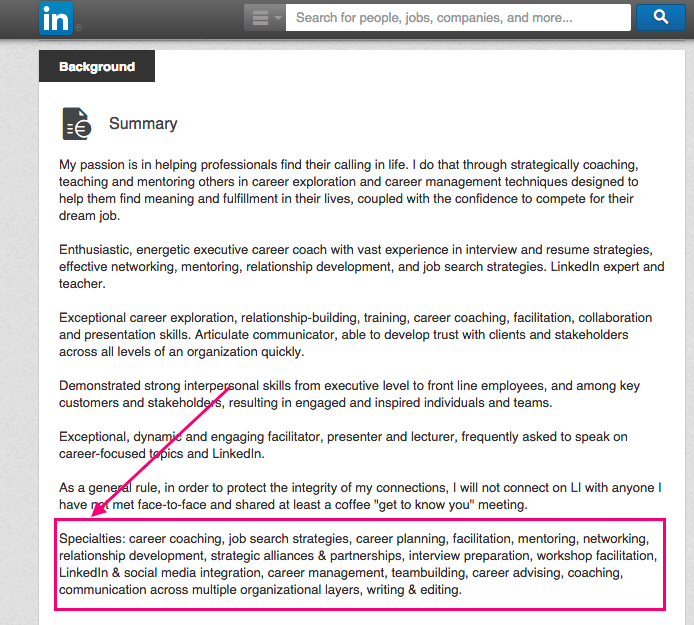 The summary is what makes LinkedIn better than a resume: it’s a place where you can turn your unique educational and professional experience into a compelling narrative for employers. “Unlike your resume, your summary needs to basically tell me a little bit about your personality,” Sass says. Tell recruiters what you love to do, what you do now and where you want to go next. If you’re looking for a graphic design job, say, “I am a collaborative, outside-the-box thinker who loves using design to make digital products come alive for users.” Include highlights from your college experience, such as specialized courses you took, sports you excelled in or clubs you led. Format your summary into a few short paragraphs to make it more readable, Sass says. Most importantly, add a section at the bottom of your summary called “Specialties,” he recommends. Employers search for potential job candidates on LinkedIn using keywords specific to the industry they’re recruiting for. Find keywords your employers might search for in job descriptions, on recruiters’ own profiles and on the profiles of candidates similar to you. If you work in marketing, for instance, the bottom of your summary could read: “Specialties: digital marketing, social media marketing and data analysis.” Sass’ profile includes a keyword-heavy section, as well. Your “Experience” section is the one closest to a traditional resume. It’s where you’ll list all the jobs (both full- and part-time) and volunteer experiences you’ve had until now. After your summary and headline, Sass says, the titles in your experience section are the most important factors in LinkedIn’s results when employers search for candidates. You can go into more detail about each job you’ve had than on your resume, and it’s OK to use “I” and to maintain a slightly more conversational tone. Don’t be afraid to include jobs outside your field or even those that don’t seem relevant, Sass says, like when you worked as a nanny or as a camp counselor. Speak confidently about the skills you developed in those positions and how they’ll apply to the job you want. 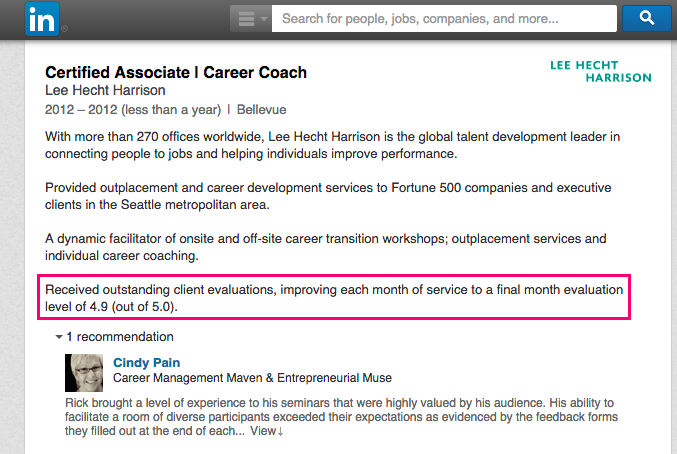 LinkedIn also allows you to embed links to samples of your work in your experience section. Include in the position description what part you played in developing each project, whether it’s a video you made for a film class or a presentation you gave at the end of your internship. Work samples are yet another way to make yourself stand out in the sea of recent grads on LinkedIn. Take advantage of the space and flexibility LinkedIn provides to show what value you’ll bring to a potential job, Sass says. Top illustration via iStock; screenshots via LinkedIn.